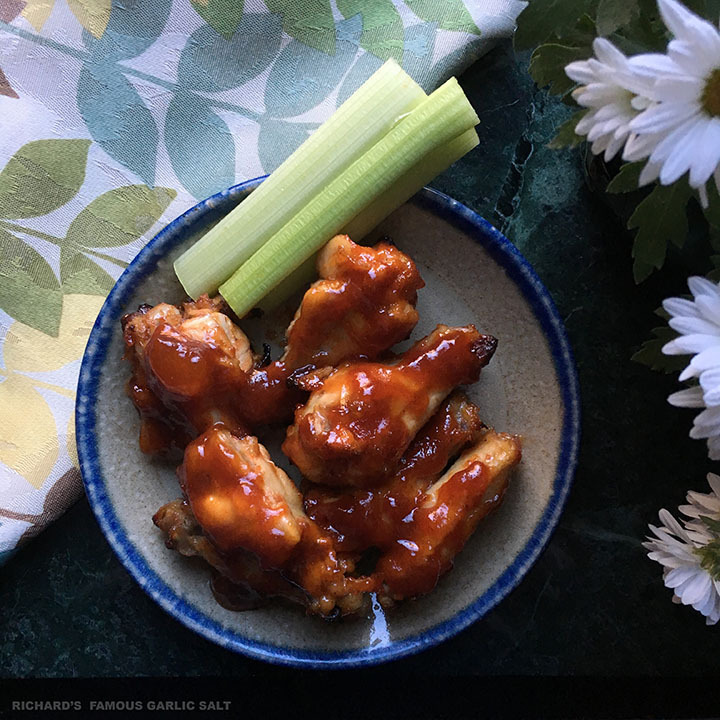 We are tickled when our raving fans tell us time and again how much they love Richards Famous Garlic Salt® and how unbelievably flavorful their food is when they use it. People absolutely love our garlic salts, with no preservatives, no gluten, no MSG, made in small batches here in New England, using garlic grown only in the U.S.A. Teaspoon per teaspoon, it has 30% less sodium than regular table salt. Because it is our incredible garlic salt is possibly unlike any other you have have ever used, it is important to know that a very small amount goes a long way. A serving size is 1/4 teaspoon. See our recipes as a starting point to guide use in your own recipes. Our salts work beautifully in savory appetizers, salads, soups, sauces, side dishes, vegetables and main dishes. We make two blends: Original Richard's Famous Garlic Salt and Richard's Famous Firecracker Garlic Salt. Our Original blend is inspired by an old-world recipe brought to this country by my grandfather in the early 1900’s from Italy. We added our Firecracker blend so that you will get the same great-tasting food with a bold new kick that will totally tingle your tastebuds. How hot is hot? We recommend you try our Firecracker flavor by rubbing 1/4 teaspoon onto each side of a one-pound steak. Cook as usual. Want more heat? Simply sprinkle with a bit more Firecracker after cooking. Try it on poultry, pork, seafood, and veggies, and also in your soups and sauces, too! “I ended up placing an order for 12 jars to give to my family and friends for Christmas. A father/son-owned company, we work side by side in New England lovingly handcrafting our garlic salts in small batches. We strive to make people smile one delicious dish at a time. We hope you'll enjoy our many time-tested family recipes on this website. You will see how easy great cooking can be with simple, quality ingredients. Use our flavorful garlic salts as a substitute for salt in your own savory recipes, too. Let us help you make your meals delicious and memorable. We are grateful for our many devoted fans who tell us their food is amazing when they use our incredible garlic salts. We think that would make my Grandfather smile. We hope you enjoy cooking with Richard’s Famous Garlic Salt® as much as we do!